For more on leadership, see our Leadership Guide. Plus, check out all of our great infographics. Make sure to tell us in the comments section below! I love your information regarding leadership, delegating, etc, and read it every day. I am a retired Navy Officer, and have been working in the Engineering Consulting Business enough to know that there are NO leaders out here. None. I am so sick of being ‘managed’, and expecting the same from me, that you can’t imagine! How can a person implement leadership when being managed so poorly? Interesting, I’m not sure how much I like it or not, but I don’t like that I am mostly a Mgr. I have to state that I am not a manager in my job and was looking at the quiz from how I feel as someone who follows direction from Mgrs/Leaders. Some of my knee-jerk reactions are leaders don’t follow the chain of command, which I think is a problem, reeks of entitlement as they are special and above it. Yeah, I like a good leader when what they do is good and popular and I agree. I’m talking generalities. Also, I get tired of people (characterized here as leaders) who want to fix what isn’t broken and end up causing more complications and problems- I’ve heard it referred to as “some new kind of stupid”. Are you sure GMOs and irreversibly changing the molecular structure of something are that great of ideas? And all for money? Which made me think of how this doesn’t deal with what I consider the be an important problem with both Mgr/Ldrs – morality and how much they possess. Also how much they communicate or remain aloof, confusing, and secretive. In a mgrs favor, I want my review on time and consistent and to be fair. If they don’t do that, does that mean they’re a leader? I definitely think rules are made to be broken. It seems like the mgr is characterized as being a nerd. I don’t see many that are like that. They don’t seem to know the rules, or follow them- they chase fires and are not logically proactive. Leaders that are emotional and “feel” that it’s the right way are illogical and scare me. they usually don’t know what is going on, don’t collect data, are subject to their prejudices or wrong assumptions, or are about ‘looks and NOT substance’, and will feel it’s right to follow that thought over a cliff. I’m just shooting this off the top of my head. I’m giving some thoughts in a brainstorm. Don’t take it personally. I think this is an interesting topic and I want to be a leader, but I question some of this. Maybe I’m jealous. Maybe it needs more tweaking. Chris… WELL SAID!!!! I’m very impressed. This was interesting. It confirmed to me that I am more a leader than a manager. After doing a personal reflection, I agree that I am more of a leader than a manager. My motto is “Always Have A Positive Attitude”; and the traits under leader confirm that as I am a motivator who sees opportunities by thinking long-term and encouraging people to do the right thing! Great thought provoking list. Several items on the management side could be said about great leaders. For example… Giving approval is a form of motivation. A compelling vision often includes clear objectives. Being wise financially in the short term can set us up for long term growth. Managers can be great leaders. For me, the distinction isn’t so much between a Manager and Leader, but a Manager and Coach. You manage situations and coach people. Management, micro or macro, describe styles of evaluating a process and progress. You can’t coach a process but you can coach someone through a process. There is a difference between following someone’s lead and obeying someone’s instruction. A leader has people willing, not just to obey, but to follow. I think the key is knowing when to be what. There are times that a Management mindset should be at the forefront and other times issues require Leadership. At other times, both skills should be equally employed. Thanks, Craig, you make a good point. I have had two professional careers over the past 60 years; uniquely engaged for 30 years in each, in the same industry – the design professions. Over the course of my first career as an architect, almost half of those 30 years were spent in the capacity of project management and the balance in leadership positions. As a manager, I find the descriptive text for the 17 traits of a manager to be the ‘worst of all possibilities’ and not the preferred traits of a manager. As a leader, I find the 17 traits listed as the preferred, ‘exemplary’ traits of a good leader. As such, this doesn’t seem to provide a ‘balanced’ comparison to choose from. Having started in my profession as an Intern, I applied myself to my assignments and worked to ensure that my performance was always of the highest caliber to attain the results I was hired to provide. This mindset allowed me to advance quickly and maintain my appreciation for my peers at each level. I have always believed in collaboration and teamwork and learned from Stephen R. Covey how to communicate and delegate effectively with my fellow project team members, regardless of their position or role. It is my belief that a manager must earn to think like a leader and a leader must learn to remember to think like the effective manager they were before becoming a leader. My profession has served me well and I continue to serve my professional colleagues with the knowledge and experience I have gained, when asked to help. I like the simple to understand and interesting way knowledge has been communicated in this article. I would love though to hear some ideas about how to balance the two qualities. Good leaders are often criticized (unfairly in my view) for being gentle and indecisive. Has anyone ever worked for a manager with these traits? If you did, I can’t believe you enjoyed the experience. Any manager who believes that this list describes their job is simply a bad manager. 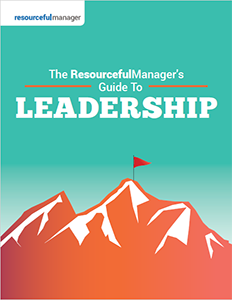 Good managers cultivate the talent and relationships within their teams, they hire well and then spend their time creating systems and channeling resources that enable their people to do their jobs, grow and thrive. They recognize potential obstacles–whether they be operational or organizational, and get out in front of them before they cause disruption. They make the hard decisions and communicate the rationale clearly to the parties impacted. They remove ambiguity and create stability, transparency and accountability. They do a lot of the things that a so-called “Leader” does–inspire trust, encourage people and most definitely foster new ideas–if all the ideas are coming from the “Leader(s)” and not from the doers, your company has issues. Who the hell would willingly work for a bureaucratic taskmaster as described above? Sounds like a dysfunctional, demoralizing, DMV-type, Office Space scenario. Did Mike Judge contribute to this article? I actually have a little angst with the utilization of the “selling” or “telling” style (Transformational leadership versus Transactional leadership) as defining a manager versus a leader. In all reality, a good manager has the ability to cater his/her message based on their audience in-between these two approaches. We’ve all had employees that needed to be coached or pushed (telling), versus employees who need to be motivated (selling). I happen to be a COO for a mid-sized nationwide organization and utilize both approaches on a daily basis. My messages to our doctors would be considered mainly selling while our clinical staff (as a whole) would require more telling. this would not suggest I am a manager versus a leader. In fact, it says I am both. I have a few of the Manager qualities, but am definitely a leader. I don’t follow rules and know that I need the team to make things work and will see others ideas and take them into consideration when seeking opportunities. Turns out that clearly i’m a leader, does that make me a poor manager. This post makes Managers sound like pejoratives.